UPDATED: Fri., March 17, 2017, 6:52 p.m.
RENTON, Wash. – The Seattle Seahawks brought back two of their most popular players. They also signed two new veterans. One adds some more experience on their offensive line. DeShawn Shead, the team’s starting cornerback last season recovering from January knee surgery, and No. 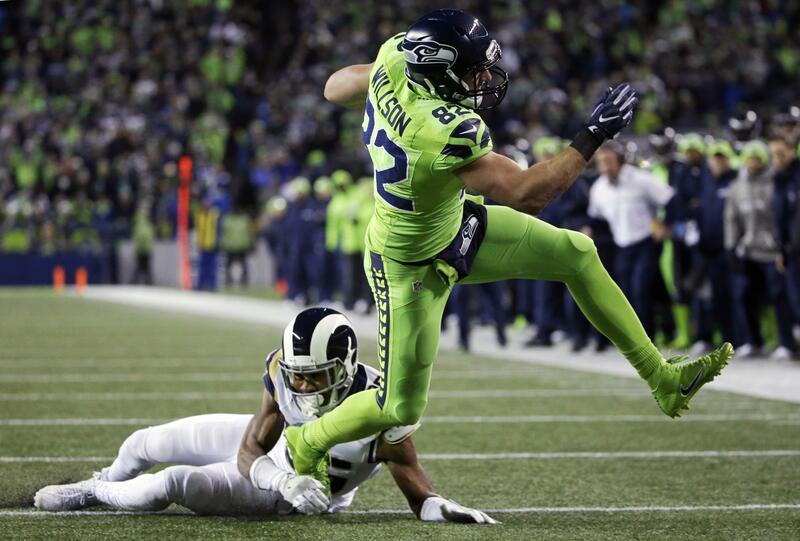 2 tight end Luke Willson re-signed with Seattle on Friday. Both unrestricted free agents are returning to the only NFL team they’ve known on a one-year contract. The Seahawks also signed 25-year old Oday Aboushi, who has started 18 games at left guard and right guard the last three seasons for the New York Jets and Houston Texans, plus linebacker Arthur Brown. Brown, 26, was Baltimore’s second-round draft pick in 2013. He has yet to start a game in four seasons, his first three with the Ravens. Last season Brown played for the Jets and Jacksonville Jaguars. But it was rumors of what has not happened with two of Seattle’s biggest stars that were getting all of the attention related to the Seahawks entering the weekend. A league source told The News Tribune a report Friday by The Huffington Post that, no, Marshawn Lynch did not meet with Carroll and John Schneider to ask for his release so he could fulfill the rumored interest in playing for his hometown Oakland Raiders this season. Lynch was in the Seattle area Thursday. When he is in town he often stops by the Seahawks’ team headquarters in Renton to hang out with his former teammates through 2015. But the TNT was told he didn’t ask the Seahawks’ decision makers or anyone of authority for anything that would back rumors that he wants to return to playing –and that his hometown Oakland Raiders are talking to him about him playing for them. Any team in the NFL would, in fact, “for the right deal,” be open to perhaps trading any player. If Jerry Jones called the Seahawks and offered his entire Dallas Cowboys starting offensive line for Sherman, sure, Seattle would listen. That doesn’t mean it’s going to happen. On March 1 Seahawks GM John Schneider said at the NFL combine Sherman’s future with the team remains strong, that he is a foundation to the franchise. Schneider made clear, Sherman’s off-field distractions in 2016 of berating coaches on the sideline and his ongoing feud with the Seattle-area media are not affecting his place or future as a team fixture. “No. He’s an elite player,” Schneider said of Sherman’s eventful 2016 season. “I mean, you know, I think everybody has bad days. Congratulations if you don’t. As for Lynch wanting to play again, for the Raiders, may or may not be true. He has been rumored to want to finish his playing days in a Raiders uniform since before he famously tweeted his retirement in February 2016. If Lynch, who turns 31 next month, indeed wants to come back to play he must first request to the NFL his reinstatement in writing. He wouldn’t come to the Seahawks for that. And asking the Seahawks for his release before he has applied for reinstatement is backwards. Not the proper way to get to play for the Raiders, or anyone. Then there’s the $9 million charge that would come back onto Seattle’s salary cap for 2017 should Lynch ask for his reinstatement and get it from the NFL. That cap charge makes a trade hard to pull off, so the Seahawks might be more likely to decide to release him if he wanted to play this year. All of that is to say there are many hurdles Lynch and even the NFL must jump before any of this would get to a Seahawks decision on where the back would run next. One thing out of all this is absolutely certain: Lynch, and those who work with him, are hugely successful in keeping his name in the news. Even while he’s still not in the game. NFL Network reported Willson’s deal to come back could be worth up to $3 million, including bonuses. The 27-year-old native of Ontario, Canada, has 74 catches through his first four NFL seasons, all with Seattle. He becomes the second Seahawks tight end signed beyond 2017. The other is 2016 draft choice Nick Vannett. Star tight end Jimmy Graham is entering the final season of his four-year, $40 million deal. Shead’s deal to return is for $1 million guaranteed, with the potential for him to earn up to $1.5 million with incentives and bonuses. Shead deal came two days after he took a free-agent visit to Buffalo for what became leverage with Seattle. He entered the offseason as a restricted free agent under Seahawks control while recuperating from surgery in late January to repair a torn anterior cruciate ligament and torn meniscus in his knee. But Seattle decided not to tender him an offer, not even for the lowest tender value of $1,797,000 for this year that it gave starting right tackle and fellow restricted free agent Garry Gilliam. Schneider said this month at the NFL combine the team didn’t expect Shead to return from the knee injury he suffered Jan. 14 in the divisional-playoff loss at Atlanta until deep into the 2017 season. That lowered his value on the open market. So it apparently went by the team’s plan. The Seahawks got Shead for less than that $1,797,000 tender value it passed up for him eight days ago. The $1 million guarantee, $200,000-plus over his veteran minimum, is a reward for being a team guy throughout his years of going from an undrafted special-teams contributor to starter. It’s also faith he can get back from his knee surgery this year. Published: March 17, 2017, 6:39 p.m. Updated: March 17, 2017, 6:52 p.m.